Viewed in the light of the Israeli Tabernacle, this chapter shows us the symbolism of the two tables of the Law, with on it the ten Commandments, which were hidden in the Ark of the Covenant. They depict the full justice of God, represented in the ten Commandments, although this "full justice of God" will, of course, only be revealed to us in the full (and thus complete) Word (viz. the bible) of the LIVING God. We can read about these perfect ten Commandments of God for the Kingdom of heaven (on earth) in Matthew 5:17-48; 6:1-34 and 7:1-29. 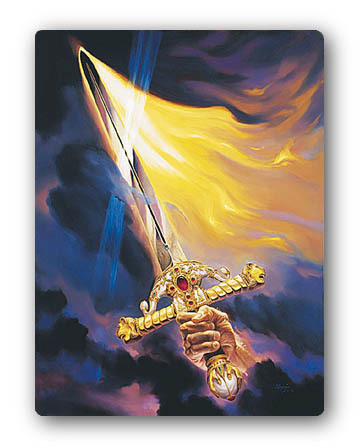 This Word of God is like a sharp two-edged sword (Hebrews 4:12 ). It brings about full grace and it forms a power of God to make into children of God (John 1:12) for those, who, by acceptance of this (divine) Word, have turned repentantly unto God and have given over their lives to Him, beside having a sincere faith in the Word of the cross and in His omnipotence to plant this Word into us. But for all the unwilling, the disobedient, the unrepentant, and the sinners, however, it forms the full and terrible judgment of a wrathful God. We can read in John 12:48: "He that rejecteth me, and receiveth not my words, hath one that judgeth him: the word that I have spoken, the same shall judge him in the last day." And in Hebrews 10:31 we read: "It is a fearful thing to fall into the hands of the living God." This full (and eternal) Word of God – which will be revealed to us by the Spirit of God in ever increasing measure in the last days (see Revelation 14:6) – will bring God's (Bride)church to the fullness of Christ in these last days. We can read this a.o. in Hebrews 9:11-12 and Ephesians 5:27: "But Christ... brought about (or obtained) an eternal redemption" ... "that He might present it to himself a glorious church, not having spot, or wrinkle, or any such thing; but that it should be holy and without blemish." This victorious Word of God is a fact in heaven, but here on earth it must still be realized in the hearts and lives of believers, who have repented unto Him. And, as we all (could) know, the Church of God has never reached this level in the course of history; even if her image in the initial period of Christianity is to be called very wonderful indeed. But, in the end-time, God will clothe His (Bride)church with the "Bridal adornments" of perfection and justice (Revelation 12:1; 19:7-8), and take her in unto the Marriage of the Lamb (Revelation 19:9), according to the promises in His Word. It should be clear to everyone that the spiritual condition of the (Bride)church must hereto be brought to that condition of the heart of the poor widow in the first verses of this chapter. 21 verse 1-4: "And he looked up, and saw the rich men casting their gifts into the treasury. And he saw also a certain poor widow casting in thither two mites. And he said, Of a truth I say unto you, that this poor widow hath cast in more than they all: For all these have of their abundance cast in unto the offerings of God: but she of her penury (poverty) hath cast in all the living that she had." In her deed this woman acted out a total offering, she gave everything that she possessed to God, to her Lord and Savior. God will find the same inner disposition in the end-time, in the heart of His (sincere) children, namely a total subjection; whereby He can bring them in His perfect, eternal redemption, and, spiritually seen, He can envelop them with the (divine) garment of spotlessness, wrinklelessness, holiness and blamelessness! "Blessed be the God and Father of our Lord Jesus Christ, who hath blessed us with all spiritual blessings in heavenly places in Christ" (Ephesians 1:3). But over those who are and remain unwilling – namely the disobedient, the idolaters and all, who wish to remain in sin – the judgment, in the fullness of God's wrath, will come of a righteous God. And this God's judgment – in and over this world – means that the demonic forces of "the spiritual wickedness in high places" will be loosed more and more, so that the people of this world will be handed over to the destructive powers of satan, in whom the wicked (and sinful) person likes to remain. These people will then have to experience the harshness, cruelty and evil of him they (consciously or not) chose for their master. Characteristic of these judgments of God are statements like: "Loose the four angels which are bound in the great river Euphrates" (Revelation 9:14 ). Hereby is meant the unleashing of demonic angels upon mankind; angels who will pour out in increasing measure their calamities and destruction on humanity! The Euphrates or Frath is a river which flows at the garden of Eden, and is symbolic for mankind. (Compare: Revelation 9:14 with Revelation 7:1-3 and Revelation 16:12 ). As the destruction of Jerusalem by the Roman commander-in-chief Titus, which was predicted by Jesus – and which was the result of the unbelieving, unrepentant Israelites of Jesus' days – took place around the year 70 after Christ, so also will the judgment predicted by God be poured out over the unrepentant part of His House (Church), and over the unbelievers, in the end-time. 21 verse 5-6: "And as some spake of the temple, how it was adorned with goodly stones and gifts, he said, As for these things which ye behold, the days will come, in the which there shall not be left one stone upon another, that shall not be thrown down." 21 verse 7: "And they asked him, saying, Master, but when shall these things be? and what sign will there be when these things shall come to pass?" 21 verse 8: "And he said, Take heed that ye be not deceived: for many shall come in my name saying, I am Christ; and the time draweth near: go ye not therefore after them." In the end-time satan will produce a great multitude of imitation spiritual workers. He will give them a (false) anointing which will imitate the divine work in Jesus. Yes, they will even perform wonders and signs; but they are wonders and signs of the liar (2 Thessalonians 2:9). And these "angels" of satan, pose as "angels of light", act as if they are real workers of God, and this is because they scorched their consciences "as with a cauterizing iron” In Matthew 7:22 we read how astonished the people were about their (eternal) damnation by God. For, although we here deal with laborers of the Lord, who digressed in sin and unrighteousness, they kept their calling. For the Spirit of God is able to (continue to) work through such people, while He passes by their personal salvation. We also notice this in the words of the Lord, which we find in Revelation 3:17b: "...and (thou) knowest not that thou art wretched, and miserable, and poor, and blind, and naked". Compare these texts regarding the false laborers also with 2 Corinthians 11:13-15. "Christ" means "anointed one", namely the anointed of God unto the labor for Him. But these people, namely those of 2 Corinthians 11:13-15, are false Christ’s, false anointed ones; for they were anointed by satan, but pose as "angels of light". Therefore God, as judgment, allows the strong delusion, because they did not accept Him – in Jesus Christ as God's redeeming, purifying and sanctifying power. We can also read about a similar judgment of God in Romans 1:18-32. And in 2 Thessalonians 2:10b-11 we read: "...because they received not the love of the truth, that they might be saved. And for this cause God shall send them strong delusion, that they should believe a lie". The same story one finds in the Old Testament, in 1 Kings 22:19-22. It will be these (false) laborers which will deceive those great multitudes of people, and catch them in their nets (Matthew 24:11 and 24). The tragic result will be that this crowd of people will be gathered as weeds in the end-time, to be bound up at the time of harvest in order to... be burned (see Matthew 13:30). Therefore let us rather be led by the true Holy Spirit of God, Who always leads us out of sin by His purifying, sanctifying and justifying works! So, the end-time is a time wherein two spiritual movements run parallel. The first spiritual movement is that of the Holy Spirit of God, Who reveals His redeeming, purifying, sanctifying and perfecting works in full-Gospel power in His own, and Who, as a result, will create a perfect Bride(church), which will be God's instrument in the restoration of the Church and at the worldwide revival in "Latter Rain Power" (i.e. the Holy Spirit revival of the end-time, as a.o. prophesied in Joel 2:23-30). The second movement, perhaps in looks more spectacular, is that of satan, which also brings forth wonders and signs, but then of the liar! The result of this will be the false (and politically minded) world church of the end-time, about which we can read in Revelation 17, 18 and 19; also called the hidden Babylon or the "Great Whore", which will prepare the anti-Christian path of the person of the antichrist. Warned by the Word of God, let us watch and pray that we too be not entangled in the snares of these – for un-anointed eyes – hidden, anti-Christian works, of this satanic power of hidden unrighteousness. Another form of divine judgment we will come across in the last days of the present-day world in increasing measure and eventually worldwide in extent, is that of war, and also of rebellion against governments of state! 21 verse 9-10: "But when ye shall hear of wars and commotions (revolutions), be not terrified: for these things must first come to pass; but the end is not by and by. Then said he unto them, Nation shall rise against nation, and kingdom against kingdom." The red horse of Revelation 6:4, the horse which is the symbol of war and revolt, will then have been loosed upon a world averse to God. Revolt against state authorities is used more and more to, under pressure, realize certain political and social goals. More and more wars and revolts in ever increasing measure make today's world seem like one great powder keg. When all this will take place, like we see it now in today's world, then the Lord comforts His children with above word of Scripture: "Be not terrified, for I have everything under control". And in Psalm 91:7-8 we read: "A thousand shall fall at thy side, and ten thousand at thy right hand; but it shall not come nigh thee. Only with thine eyes shalt thou behold and see the reward of the wicked." And further in verse 10: "There shall no evil befall thee, neither shall any plague come nigh thy dwelling (house)." This judgment of God will only pass us by if we remain in the center of the will of God, Who is our hiding place. As there can only be that wonderful calm in the eye (namely the center or heart) of a raging and an all-destructive whirlwind, so will God also let His own hide in the shelter of His omnipotence, when His judgments of war and revolt are raging around us! 21 verse 11a: "And great earthquakes shall be in divers places, and famines, and pestilences..."
21 verse 11b: "...and fearful sights and great signs shall there be from heaven." In Revelation 6:12-14 we read: "And I beheld when he (the Lamb of God) had opened the sixth seal, and, lo, there was a great earthquake; and the sun became black as sackcloth of hair, and the moon became as blood; And the stars of heaven fell unto the earth, even as a fig tree casteth her untimely figs, when she is shaken of a mighty wind. (We see the same thing when we sit on a train. Then it seems as if the trees on either side of the train flash by; but in fact the train races on, and the trees stand still. The same way the earth will be moved from her place, possibly by a collision with a meteorite, while the stars stay in their places.) And the heaven departed as a scroll when it is rolled together; and every mountain and island were moved out of their places." Enormous catastrophes, great disasters as a result of (very) far-reaching changes in nature and in the universe, as it were make a clean sweep in order to prepare this earth for that wonderful and divine era, called the Millennial Kingdom. For in this (divine) Kingdom the sun will shine seven times as strong as it does now (Isaiah 30:26), because of which there will be no more night (Zechariah 14:6-7). It goes without saying that man and beast with a body of flesh and blood cannot live in that Kingdom, and God will have to create a nature of a totally different composition. It will be a paradise in the full glory of God! Another form of God's judgment we find in the persecution mania and the demonic oppression which then will rule the world. An ever increasing anti-Christian spirit will take possession of all disobedient and unrepentant people, besides increasing satanism. All this will pave the way for the global acceptance of the antichrist as ruler of the world. 21 verse 12-19: “But before all these, they shall lay their hands on you, and persecute you, delivering you up to the synagogues, and into prisons, being brought before kings and rulers for my name's sake. And it shall turn to you for a testimony. Settle it therefore in your hearts, not to meditate before what ye shall answer: For I will give you a mouth and wisdom, which all your adversaries shall not be able to gainsay nor resist. And ye shall be betrayed both by parents, and brethren, and kinsfolks, and friends; and some of you shall they cause to be put to death. And ye shall be hated of all men for my name's sake. But there shall not an hair of your head perish. In your patience possess ye your souls." CLICK HERE if you want to read this study (Chapter 21) – that is to long for the Blog.